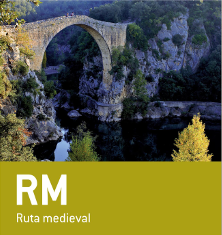 History towns: Besalu, Santa Pau and medieval villages of La Garrotxa. The villages are a testimony of time, and there are very good examples in La Garrotxa, with permission of the earthquakes that hit the region over the years 1427 and 1428. From medieval to contemporary, through the Jewish legacy, the Renaissance and Art Nouveau, the villages of the Garrotxa have a story you need to know, a past that has left witnesses first order. We begin this medieval route in Sant Joan les Fonts and one of the first places we recommend you visit is the church of the old Benedictine monastery. To reserve a visit, please call: 972 29 05 07. Declared a National Monument, this monastery boasts three naves and porch covered by a late atrium. Also of note are the Romanesque baptismal font decorated with bas relief and a carved Christ-figure, the original of which is kept in the Diocesan Museum in Girona. Dating from the same era is the medieval bridge that joins the old part of Sant Joan and the parish church to the Castanyer quarter. Built from volcanic rock, the bridge over the river Fluvià consists of a single large arch with two smaller lateral arches. Nearby we find the oldest Romanesque civil building in Catalonia, the castle of Juvinyà, a fortified manor house that was declared a Monument of National Interest in 1972. In recent years the building has been completely restored and now that has been converted into the Sant Joan les Fonts Territorial Interpretation Centre. The whole of the village of Santa Pau merits special attention. The historical centre is presided over by El Castell de la Baronia (the Baron’s castle), which is mentioned in documents from the 13th century onwards. Square in shape, this building today consists of a central courtyard and adjoining quarters that is the result of additions made between the 13th and 15th centuries. To the south we find the triangular-shaped Plaça Major, once known as the Firal dels Bous (the ‘oxen fairground’) since it was used as a marketplace and fairground. This medieval square, which has remained practically unchanged since the first decades of the 14th century, is one of the best conserved such squares in Catalonia. Besalú, the third stop on this medieval route, is one of the best preserved medieval towns in Catalonia and boasts religious and civil buildings (for example, the monastery of Sant Pere) of great interest. Founded in 977 and consecrated highly original window adorned with the figures of two lions, symbols of the power and the protection provided by the church, which stand, respectively, on a monkey and a naked man, representations of evil and paganism. hostel for travellers) with a 12th century façade, while a little further away are the Romanesque church of Sant Vicenç, with transitional elements between the Romanesque and Gothic, the Cúria Real and the Collegiate church of Santa Maria, two further examples of the wonderful cultural herit- in 1003, the façade of Sant Pere is renowned for a age of Besalú. The Pont Vell (old bridge), dating from the 11th century and reconstructed a number of times over the centuries, is 105 m long and 30 m high; as the main gate into Besalú it is the true symbol of this marvellous medieval town. Nevertheless, visitors should not leave Besalú without having first visited the mikvah and synagogue. Discovered in 1964, the former is the only example of Jewish purification baths to have been found in Iberian Peninsule and only the third of the ten ever found in Europe. The ongoing archaeological digs in Besalú are continuingly throwing up new surprises in this beautiful town.